Thousands of Invisible Children supporters descended in red t-shirts on the D.C. Convention Center earlier this month for the group’s largest event of the year: MOVE:DC. While I walked 15 minutes from my apartment, there were attendees who had flown from Brazil and driven from California, all united in their commitment to ending the atrocities of the Lord’s Resistance Army, or LRA, and apprehending now-infamous rebel leader Joseph Kony. On Friday, November 15, IC hosted Lobby:DC, an all-day event bringing activists to the heart of U.S. policy with meetings on Capitol Hill. Over 700 activists received training from IC staff on how to engage Congress members and urge them to support the pursuit of Kony. While lobbying experience varied among the crowd, the fervor each individual brought to the Hill was the same. The crowd represented almost every U.S. state and spanned all age groups, but the most represented demographic was youth. The high numbers and enthusiasm present Friday morning was a clear demonstration that youth are active, engaged, and committed to seeing justice brought to one of the world’s worst human rights offenders. Saturday morning’s global summit featured a host of civil society leaders and politicians from central and east Africa; representatives of influential international bodies; Ugandan survivors of the LRA; U.S. Assistant Secretary of State for African Affairs Johnnie Carson; and LRA experts, including Enough Project Co-founder John Prendergast. It kicked off with an enthusiastic introduction by Jason Russell, Invisible Children’s co-founder and chief creative director, and Jedidiah Jenkins, director of idea development. Keynote speaker Sean Stephenson, “The Three Foot Giant,” spoke about the importance of having a vision for one’s life, and gaining the momentum to achieve that vision. The vision of MOVE: DC was to maintain the attention of world leaders, hold them accountable, and explore new options for ending the LRA’s reign of terror. In his remarks, IC CEO Ben Keesey stressed that a key factor that allowed for the presence of leaders on the stage was the activists in the seats. The first panel, moderated by Keesey and Michael Poffenberger of Resolve, featured leaders from the African Union and LRA-affected areas in South Sudan, Uganda, and the Central African Republic. Noticeably absent were voices from Sudan who were invited but not present, and Congo, where President Kabila at the last moment denied authorization for their intended panelist to attend. Notably, Honorable Rebecca Otengo, state minister for Northern Uganda, spoke passionately on the panel about the challenges Uganda faces in rebuilding after the LRA and described the importance of IC’s work with educational and rehabilitation programs on the ground. The second panel, moderated by Keesey and John Prendergast, included representatives from international organizations including the International Criminal Court, or ICC, the European Union, and the United Nations focused on the international community’s efforts to help end the LRA. Both panels provided productive discourse on challenges and opportunities for apprehending Kony and other top LRA leadership, and the importance of continued pressure from activists. Following the summit, we marched. 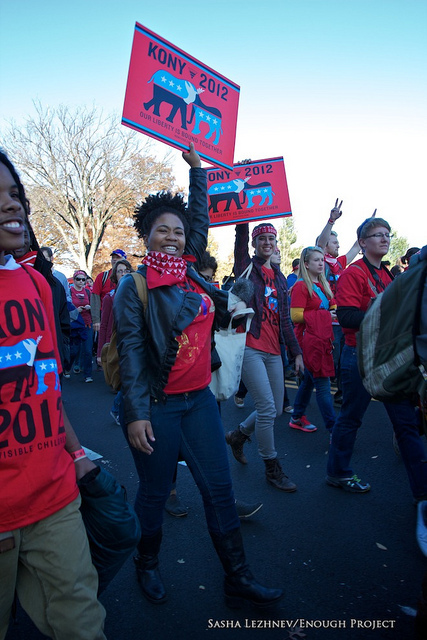 I was one of a sea of red-shirted activists who walked down Pennsylvania Avenue to the White House, rallied, and kept marching until we found ourselves congregated in front of the Washington Monument. Invisible Children got people mobilized and excited to take action. What was reflected most at MOVE:DC was a reverence for human life, a representation of many opinions, and a collective voice advocating for international justice. Watch part 1 of the video of the Global Summit on the LRA below, and click to see parts 2, 3, and 4. Patricia Garrity contributed to this blog post. This post has been amended to say that "thousands" of IC participants took part in this event, not 10,000. Invisible Children reports it had more than 12,000 people register to attend. Fewer than 10,000 people were present at the rally, though the precise figure is not yet clear. One Enough staff member in attendance reported, "It was the biggest Africa human rights protest I've ever been to."